FlightScope has made some huge improvements compared to a previous model that Jeff Hull and I had tested. There were major problems with the data that the earlier FlightScope was producing, namely the Angle of Attack data. It would give data that made no sense. Also, the vertical plane angle seemed to be reversed at times in the earlier model. In other words, hitting from your knees would make the plane steepen. As a result, I would not have recommended FlightScope, in the past. When we tested the new FlightScope and Trackman, yesterday, almost all of the numbers were the same. The ball data, clubhead speed, carry distance were almost the same. What little differences there were seemed to be very consistent differences from shot to shot. The Angle of Attack data has been completely changed for the better, with the new software in FlightScope. It is understood that no matter what two devices, TM versus TM, FS versus FS, or TM versus FS, there will be slight differences in the data. The horizontal plane data, when I intentionally swung underplane, was a greater number with FlightScope (7.4 degrees under) where Trackman registered less (4.0 degrees under). I was inclined to believe that it was closer to 7 based on the video. But, that's a personal opinion. When the data would have seemed to produce a hook, with the clubface closed compared to the path, both devices registered a fade when the ball was hit off center toward the heel. Even though I was trying to change path and face, solid contact was very good most of the time. But, the contact was 1 to 2 dimples to the right or left of the center line of the sweet spot, giving different results in the flight although there were similar face and path numbers as previous shots. We determined that hitting outside of your boat with your bait may be an easier task than hitting the center of a golf club. So, I'm off to Bass Pro Shops! As a consumer, I find very little if any difference in the data. The wireless feature of FlightScope is appealing as it could be used with a computer, ipad, or smart phone with no tether. Also, the new FlightScope features self-leveling and alignment camera as does Trackman. As with any product in any industry, when a monopoly exists, cost will remain high. As the products become similar, the prices have to move. Both will have to make adjustments. But, the difference in price is still quite large. 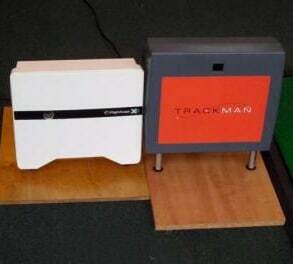 My Opinion: I see nothing that would make me inclined to buy Trackman over FlightScope, since cost seems to be the biggest difference. I think I'd save the additional $10,000 and buy FlightScope.